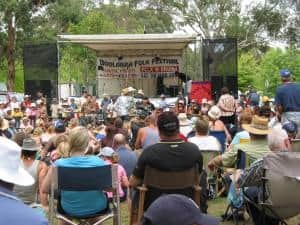 Boolarra Folk Festival is a 1 day music and market stalls event. The festival is held in the beautiful Centenary and Railway parks in the town centre. The music starts at 11 am, with about 14 musical acts performing during the day before the event and concludes around 8pm. There are about 50 market, art, craft and food stalls set up in the adjoining park for those who wish to have a break from the music and wander around. All camping at the Recreation Reserve and the Boolarra Hotel grounds is free where toilet and shower facilities are also provided. After the festival is over in the park there is live music and jam sessions at the Boolarra Football Social Club rooms until around midnight.